For the song by Blind Melon, see Nico (album). 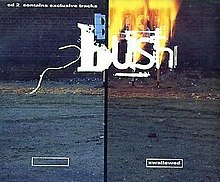 'Swallowed' is a song by British alternative rock band Bush. It was released on 15 October 1996 as the lead single from the band's 1996 album, Razorblade Suitcase, which topped the US Billboard 200 chart. It was later included on the remix album Deconstructed, the live album Zen X Four, and the Bush greatest hits compilation. "Swallowed" was released as the lead single from the follow-up to their massively successful debut album, Sixteen Stone, which was released two years prior. Upon release, the song topped the Billboard Modern Rock Tracks chart for seven consecutive weeks and peaked at number 27 on the Billboard Hot 100 Airplay chart. This is the longest Bush ever stayed at number one on any chart. 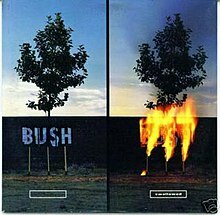 It was also Bush's biggest hit in their native Britain, where it peaked at number 7 in the UK Singles Chart. It was nominated for Best Hard Rock Performance at the 1998 Grammy Awards, but lost to the Smashing Pumpkins' "The End Is the Beginning Is the End". This was the band's fourth crossover hit to Top 40 radio after "Comedown", "Glycerine", and "Machinehead". A power ballad, the song is in A-flat major. The video was nominated for several MTV Video Music Awards. ^ Sterdan, Darryl (10 April 2012). "Bush Returns To Canada". Toronto Sun. Retrieved 25 November 2018. ^ "Bush – Chart history – Billboard". Billboard. Retrieved 6 May 2014. ^ Hoard, Christian David; Brackett, Nathan (2004). The New Rolling Stone Album Guide (Revised ed.). Simon and Schuster. p. 122. ISBN 9780743201698. Retrieved 27 February 2019. ^ http://www.fireballmedia.ie, Jaclyn Ward - Fireball Media Group -. "The Irish Charts - All there is to know". Archived from the original on 21 July 2011. ^ "BUSH - full Official Chart History - Official Charts Company". ^ "Bush Chart History (Alternative Songs)". Billboard. Retrieved March 11, 2017. ^ "Bush Chart History (Mainstream Rock)". Billboard. Retrieved March 11, 2017. ^ "Bush Chart History (Radio Songs)". Billboard. Retrieved March 11, 2017. ^ "RPM Top 100 Hit Tracks of 1997". RPM. Archived from the original on 5 August 2017. Retrieved 26 November 2017.